All of my cotton socks are made in Italy and are 200 thread count, so they’re extremely soft. By joining the sock service, I’ll send you the amount you need every third month. If you find you have too many or too few you can always change the amount or pause deliveries. As always, you can, of course, cancel anytime. And if you aren’t sure which style you want, you can always change up the style from time to time! All just a few clicks from your account. 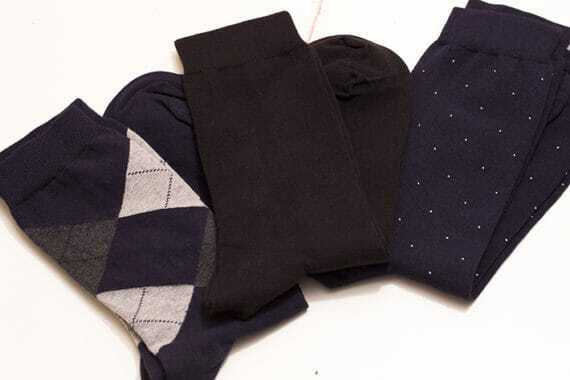 No matter how many you buy, socks have a habit of dwindling away until you’re nearly out. Where do they go? That’s still a mystery, but the solution is clear: keep your sock drawer topped up with a regular trickle of fresh socks. That’s a great treat because putting on a brand new pair of socks is one of those very satisfying little pleasures in life. I suppose that’s the silver lining to disappearing socks: you get to have fresh ones automatically show up! For too long men have dealt with an unjust dilemma: to shave with an over-priced, over-marketed razor that insults their intelligence, or to shave with a cheap razor that insults their skin. It’s time for a better way to shave; top razors at a fair price, with a subscription that is delivered at regular intervals so you have one less errand to run. I cannot recommend these razors highly enough. They get delivered to me right on time and they last long enoough even if I shave every day, Actually it is better tio shave every day then the bristle will not clog the blades. I also use the shaving soap rather than a gel as that seems almost purposefully designed to clog the blades and make you buy more! Trust me the soap here is good and is easy to rinse out the razor. Just come back from a 2 week holiday and had forgot to these razors with me and had to revert to my old ones didn’t realise how much better the BC blades are only thing I was glad to come home to!!! Love the new blades! The moving head is so much better and I think the new one lasts for longer. Also, the handle is much easier to use and I like the weight. Awesome change, guys! Honestly the best shave I've ever had. New design is great, the rolling pin is a stroke of genius! Only thing I would say is the handle could do with a better grip, difficult to hold with wet hands. The latest design of blade is honestly the best shave I've ever had. They do exactly what you say they're going to do. The extra spacing between blades means they really don't get clogged like other 5 blade heads do, they're a smooth shave, and there's much less razor burn. Props to you Colonel, you've nailed this one. I've been using the Bearded Colonel'so razors for more than a yearGood price, prompt delivery, excellent shave.Then new version arrived. I couldn't figure how to put it together But amazing customer support got me going quickly.Can't praise The Colonel too highly. Not often you get quick personal answers from the boss man these days BUT YOU DO WITH THE COLONEL!! just received my latest set of blades. individually packed the new style blades seem to be a good upgrade. also received three handles FOC so i can replace my old style handles. once again the bearded colonel has exceeded its customer service. they even threw in a travel cover. well done the bearded colonel. Great blades, but why the change to purple without any hint of an explanation? ...and shipping... that's on us!